Now that most tourists have left the island, a saturated silence has descended upon the greening hills and mountains. The quietness is only disturbed by twittering birds or a gust of wind playing through the trees. With no Zeus reining his horses across the white foam-capped sea, the waters are also resting. There’s a little fishing boat approaching, the sound of its purr-purring motor good for meditation. That may be why so many men on Lesvos love going fishing: either swaying in a little boat on sea or from the beach while smoking and gazing out to sea. If a fish decides to bite, so much the better. However last week the coast of the north was vibrating due to roaring motors far away. In the Turkish waters there were at least twenty enormous fishing trawlers emptying the sea. Because of their super bright lights, it was like being across from Istanbul. I can’t bear to think about the tonnes of fish lifted from the sea that night. Like elsewhere in the world, the number of fish on Lesvos is decreasing dramatically. 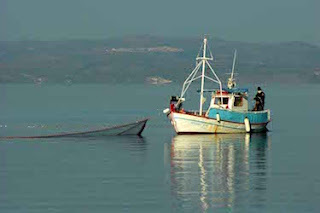 Not due to the Lesvorians: they have only a few big trawlers (Greece has approximately 300). The fishing fleet of Lesvos consists mostly of small, traditional fishing boats, some still wooden. There will be one man looking out for a school of fish, while another man steers the boat over the waves. The island has many picturesque harbours where the colourful little boats wait to embrace the sea. Two years ago the fishermen really had a bad year. They nearly only fished refugees out of the sea. Not only did they not bring home fish, many of them became traumatized. Now war ships and those of Frontex guard the seas and pick up the 2 to 4 boats of refugees arriving each night, leaving the fishermen with plenty of time to do their fishing things. Small fishermen deliver mostly to local restaurants. Super fresh is the fish that will appear on your plate. Fish however also have seasons: now it’s the time of palamida (bonito) and lakerda (as many Lesvorians call this small kind of tuna; originally lakerda is a way to pickle fish). The world famous sardines from Kalloni are only served in the summer, while in winter you can enjoy shell fish. On stormy days or nights when the full moon makes the nets visible even to the fish, no fisherman shows up on the water, meaning days without fish. In Eftalou (not far from Molyvos) there once lived the famous fisherman Adonis. He lived on the beach with many cats, dogs and a seagull. His father was also famous. The book Ψαρόγιαννος (fisherman Yannis) by Takis Chatzianagnostou is based on this family and was even made into a movie shot on Lesvos, with great music from Yannis Markopoulou. Watching a trailer of the movie, I experienced déjà vu: the images show unashamedly the Lesvorian version of the famous Zorba-the-Greek dance, once so beautifully performed by Anthony Quinn. I checked it: Zorba was released in 1963 and the other mentioned movie in 1966. 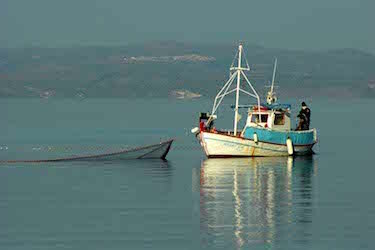 Andonis can be seen in an interesting documentary about the fishermen of Molyvos: Ψαραδες και ψαρεματα (Fishermen and their ways of fishing). This movie shows that in earlier times the battle between fishermen and fish was much more honest. With dancing feet and stones the fish were lured to the nets or spotted through bottomless buckets. There is no longer communal fishing, apart from those huge fishing monsters, hiding along the Turkish coasts, emptying the seas around Lesvos. And there are not many young people following in the steps of their father, taking a little boat to the sea: the catches are less and less worth the trouble. If this continues fishermen will also be threatened with extinction, just like the donkeys which, after the death of donkey man Michaelis, are rarely seen in the north of Lesvos. What a shame if the purr-purring sound of little boats gets lost and I am wondering who will be the first starved out: the fishermen or the fish.